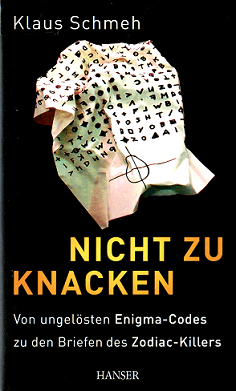 “Nicht zu knacken” ist ein Buch über die zehn faszinierendsten Rätsel der Verschlüsslungstechnik. 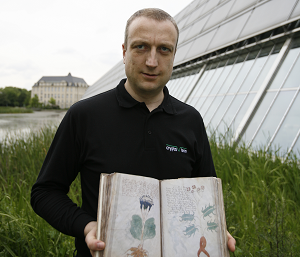 Das berühmte Voynich-Manuskript, ein verschlüsseltes Buch aus dem Mittelalter, das nie gelöst wurde. It is absolutely not certain, that the Voynich MS is an encrypted book. As long as the script has not been identified no one can tell for sure wether the text is in natural language or in code. From my own analysis of character frequency and distribution of the Voynich MS Latin has the best chance. You are right. I often say “the Voynich manuscript is an encrypted book”, but of course this is simplified. The relevant statistics are in the table on the right, which is the Voynich letter frequency table. Unfortunately my website is in Dutch. As a next tpoic you may be interested in, is the Agapeyeff cipher on which I am working recently. I think I can ”demonstrate’ that it is a dictionary code. The dictionary code is a complete new option for the d’Agapeyeff cipher. Work in progress. In this case the text is in English.